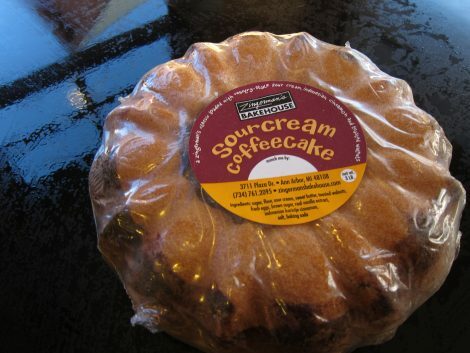 But it makes hungry where most it satisfies, and I reasoned that if second best was so incredibly delicious, then I had to get Sweet Leisure cooks the first-best, most-favorite, top-seller Sour Cream Coffee Cake recipe. But no matter how much I begged, cajoled and pleaded, the recipe remained secret. In honor of the artisanal bakery’s 25 anniversary, Zingerman’s released it’s first ever cookbook and it’s a stunner. 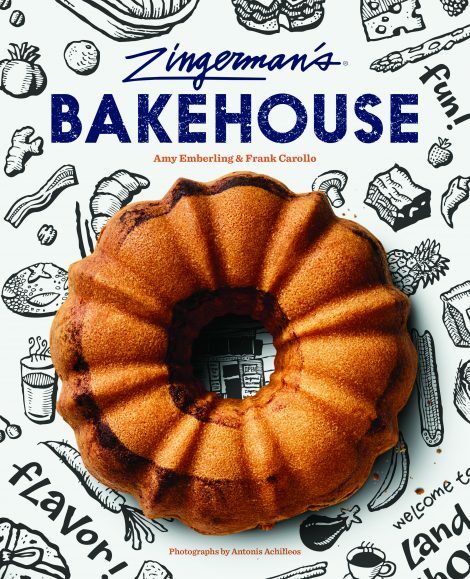 ZINGERMAN’S BAKEHOUSE cookbook, fills 255 pages with interesting food and business-related stories, seductive photos, and best of all, 65 well-tested recipes including one for the Sour Cream Coffee Cake and a variation, Lemon Poppy Seed Coffee Cake. HALLELUJAH! Trust me, no matter if you are a professional baker or first-time cook, you will want this cookbook. ZINGERMAN’S BAKEHOUSE by Amy Emberling & Frank Carollo. Photographs by Antonis Achilleos. Chronicle Books/October 2017. Hardcover/$29.95. To order the book from Zingerman’s Mail Order, click HERE. 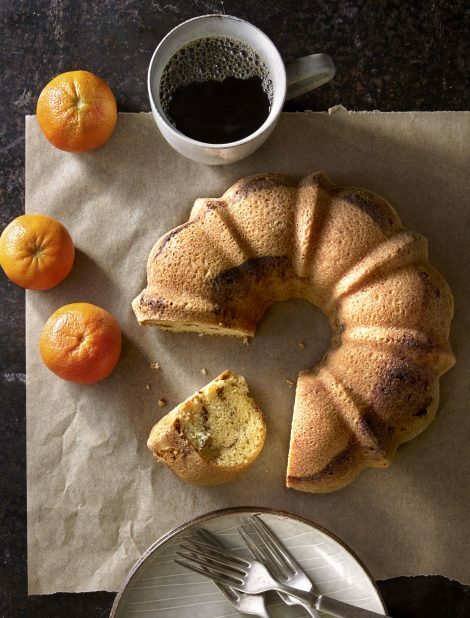 Yield: 9-inch [23-cm] bundt cake. 1. Preheat the oven to 325°F [165°C]. Spray a 9-in [23-cm] Bundt pan with nonstick cooking spray, coat with flour, and set aside. 2. Toast the walnuts on a sheet tray for 10 to 15 minutes, or until they’re a deep golden brown. After they are done, turn the oven down to 300°F [150°C]. 3. In a small bowl, mix together the toasted walnuts, brown sugar, and cinnamon. Set aside. 4. In a large mixing bowl, combine the sugar and butter. Cream by hand or with the paddle attachment of an electric mixer on medium speed. Mix until the color lightens. Add the eggs, one at a time, creaming thoroughly after each egg until the mixture is homogeneous. Add the sour cream and vanilla. Mix briefly until light and creamy. Scrape the sides of the bowl to make sure all of the ingredients are evenly incorporated. 5. Combine the flour, baking soda, and salt in a separate medium bowl. Mix to combine. Add the flour mixture gradually to the creamed mixture and mix by hand or with a mixer on low speed until smooth and homogeneous. 6. Scoop one-third of the batter into your prepared pan. Smooth it evenly over the bottom of the pan with a spoon. Sprinkle one-half of the nut mixture evenly over the batter. Cover with another third of the batter. Smooth it evenly over the nut mixture and to the edges of the pan. Sprinkle the remaining nut mixture evenly over the batter. Spread the remaining batter evenly over the nut mixture. 7. Bake for 60 minutes, or until a skewer comes out clean. Cool for 15 minutes. Do not leave the cake in the pan for much longer than this. The brown sugar in the nut filling might stick to the sides of the pan and make it difficult to release the cake. 8. Put a wire cooling rack on top of the Bundt pan and then invert the pan to release the cake. Cool to room temperature before eating.